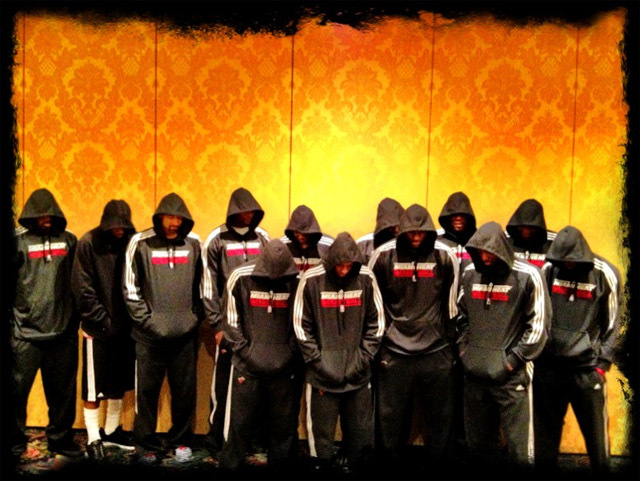 The NBA Miami HEAT Players came together for a group photo to show support for Treyvon Martin, the young 17-year-old African American man who was unlawfully shot to death last month in Florida for allegedly “looking suspicious” while walking home from the store, wearing a hoodie, and carrying a bag of skittles, and a can of ice tea. The photo shows the players standing with their heads down in a moment of silence wearing hoodies, to send the message that not everyone who wears a hoodie are up to no good. LeBron James uploaded the photo to his Twitter yesterday with the hashtags #WeAreTreyvonMartin, #Hoodies, #Stereotyped, #WeWantJustice. Hopefully the parents of Martin received the hard copy of the photo, as it surely is one to hang on the wall in loving memory.